We're Good With Scott Pruitt Murdering Life on Earth Though, Right? E.P.A. Administrator Scott Pruitt’s evil is pretty underrated. 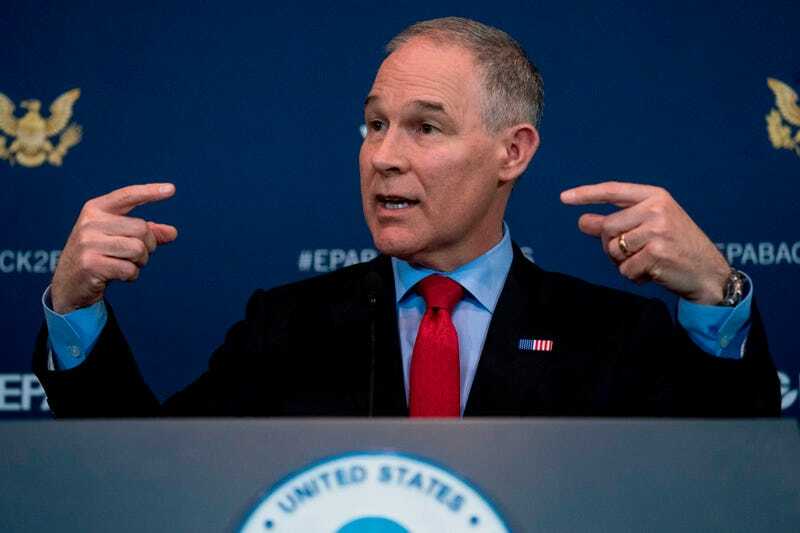 Drowned out by the administration’s daily cacophony of homophobic manikins and misogynistic mouth-breathers and racist cave-dwellers, Pruitt plays more of a Mr. Burns, plotting in the wings, slowly dismantling the agency he is sworn to protect. But now he’s making the president look bad, and it has to stop! I don’t mean to denigrate Mr. Pruitt, but doggone it, he represents the president of the United States, and it is hurting his boss. And it needs to stop. Pruitt’s been in the elimination chair this week for abusing the Safe Drinking Water Act to get six-figure pay raises for aides, accepting a very low-priced condo rental from lobbyists, and abusing taxpayer dollars on security detail and trips (including one to Disneyland) which the Associated Press’s current tally runs up to $3 million. Trump has been reportedly displeased with the bad press, which leeched well into the Sunday morning cable news. “Oh, he has too big of a security detail? Is that suddenly the reason why you fire someone?” he asked. In fact, there are other reasons to fire him! He was okay with cutting the E.P.A. budget by 31 percent. He has proposed repealing or delaying more than thirty important environmental rules in just one year, the New Yorker reports; he posits that climate change is up for debate and supported leaving the Paris Accord; he went to Morocco to shill US natural gas (at a $40,000 expense); it’s reportedly well-known that he barely meets with environmentalists and spends the majority of his time with polluters his agency is supposed to regulate. Margaret Talbot also mentions that Pruitt sued the E.P.A. 14 times throughout the Obama administration. Towards the administration’s broader goals of dismantling decades of progress piece by piece and replacing it with nothing, it’s hard to imagine anybody doing a better job. Trump said so himself!